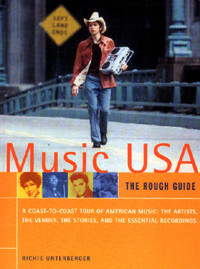 The 500-page Music USA: The Rough Guide(1999, Penguin Books, $23.95) surveys the regional popular music of the United States, with chapters on the evolution of styles throughout the twentieth century in these areas: New York, Philadelphia, Appalachia, Nashville, Chapel Hill, Athens, Miami, Muscle Shoals, Louisiana, Mississippi, Memphis, Chicago, Cleveland, Detroit, Minneapolis, Texas, the Southwest, Los Angeles, San Francisco, Seattle, and Hawaii. Each section includes capsule reviews of the most essential recordings in each genre, and sidebars on key behind-the-scenes figures in each region, drawing upon first-hand interview material. The end of each chapter presents listings oft venues, festivals, radio stations, publications, record stores, books, and videos to investigate if you're traveling to or want to learn more about certain locales. Take a look at the sample excerpt below for a taste, and also dig into a few complete transcripts, exclusive to this website, of interviews conducted for the book. Music USAis widely available at both independent booksellers and chain bookstores throughout North America, as well as many such outlets overseas. To order on-line via amazon.com, click on the book cover below.